Manchester United striker Romelu Lukaku couldn’t resist a cheeky little dig at rivals Liverpool as he picked up a special award. In the video below, the Belgium international was presented with a prize for reaching a century of goals in the Premier League earlier this year. 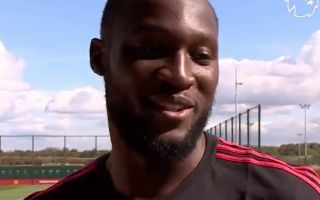 Lukaku is now on 104, the same as one of his idols Didier Drogba, but as well as discussing him he also fondly remembered his first goal at this level. That came during his time as a West Brom player, and was against none other than United’s bitter rivals Liverpool. Of course, the striker couldn’t have known then that he’d end up at Old Trafford but he still remembers it fondly due to the Red Devils connection he has now.